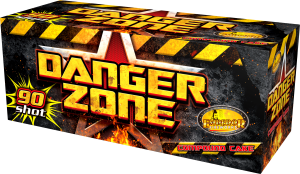 The Power of 3 Barrages in 1 - Danger Zone takes fireworks to the next level. A well timed compound barrage continuously firing a myriad of wide bursting effects. Part 2: Silver Comets Exploding into Silver Coconuts set with Red Pearls, Green Comets Bursting into Bright Purple and Vivid Green Peonies, Golden Tailed Comets Producing Beautiful Wide Golden Dahlia with Blue Pearls. Part 3: Red Comets Spreading into Contrasting Deep Red & Emerald Green Peonies, Green Comets Bursting into Stunning Purple & Green Stars with Golden Strobe, Sapphire Blue Comets Exploding into Golden Brocades Set with Blue Pearls. A display in a box...let the sky come to life! !